Lanard's new Primal Clash toy line is something special. Exclusive to Walmart here in the US and available as Jurassic Clash in other countries. The line serves as that mix of everything awesome that toy aisles have been needing for quite some time at a low price that is most welcome. I remember when the Jurassic Clash figures first started popping up online, I was ecstatic. I've long time been a fan of The Corps! action figure line as is. 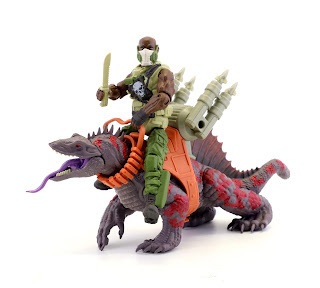 When Lanard started doing the Skull Island and Rampage toy lines, I was amazed. Here was this perfect synergy of monsters and soldiers, and the Kong from 2017 was almost every bodies toy of the year. Primal Clash takes that idea of man vs. monsters and adds that element of post apocalyptic sci fi that I love so much. Lanard is following the same formula they did for prior monster lines, using a Corps! action figure and pairing it with a monster. For Primal Clash, they're using dinosaurs in a setting taking place in the future after mankind has brought back dinosaurs. The setting merges Terminator and Jurassic Park in a very well crafted and fun way (and all on the back of the toys package!) that seems like a lost game by SEGA. 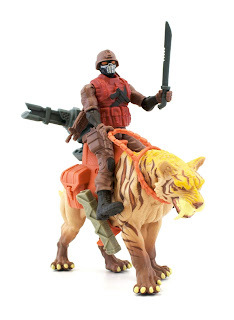 Like the prior lines, the figure isn't named, though I'm sure you could fairly use the Corps! incarnations name if you chose. This isn't really an issue, though I do wish there was a little variation in the deco (I'm sure that's a budgetary move). The dinosaurs are HEAVY. Solid pieces of plastic with no articulation (you will hardly notice), the dinosaurs are almost perfect little statues with great paint apps and full of character. 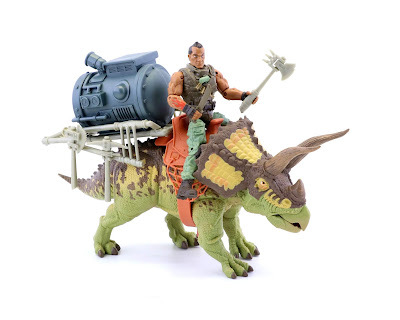 The action figure is loaded with accessories that can be stored on the figure as well as the dinosaurs saddle features some sort of play feature (moving cannon, etc) with reigns the figure can hold while riding. There is a LOT of play value for not a lot of money. With such a great and fun line, I can only wonder what Lanard has planned next. Part of me is hoping for mythological monsters or cryptids, maybe even more diabolical like demons and such. I'm also hoping more of the Jurassic Clash stuff finds it's way over here to Walmart shelves as it's hard not to want it all (and at the price, that's easily done). I've been finding myself imagining more possibilities within the line. It's hard not to get excited and just enjoy yourself with Primal Clash. Almost impossible, actually. Like a primal urge or something. Very cool review! I couldn't agree with you more. Get Zone Base in your inbox, Subscribe today!